Yesterday we held our family Birthday Bash for Lily, who turned five last week. I like to bake and decorate a cake for the girls’ birthdays, since I have fond memories of my mom making my birthday cake. (I just use cake mix and store-bought frosting; don’t get too excited!) Lily’s very first cake was a flower cake; the frosting was a little bumpy and uneven, and it definitely didn’t look like a bakery cake. Lily was a very finicky eater when she was one, and she didn’t like her fingers to get messy. She wouldn’t even touch the cake, much less eat it! We tried to put her finger in the frosting, but she wanted NOTHING TO DO WITH CAKE! For Lily’s second birthday, she wanted a party that was all about doggies. I made a cake with chocolate dog bones on it, and she was quite different about eating cake now that she was two. In fact, she really got “into” helping me decorate her cake. For Lily’s third birthday, I kept the cake simple. I made her another flower cake, and decorated it with three ladybugs. We sang to her and she blew out the candles on her cake in the family room so that Ed’s mom could join in the fun, since she wasn’t able to walk up the stairs to our dining room. Having her cake on a TV tray didn’t bother Lily one bit! This year, Lily turned FIVE, and so was very specific about what she wanted on her birthday cake. She wanted a butterfly cake with a picture of Buddy the T-Rex from Dinosaur Train on top, AND she wanted to decorate the cake BY HERSELF. I finally convinced her that a butterfly cake would be great, and we didn’t need to put Buddy on top. I helped fill in the body of the butterfly, and I was going to smooth out the purple wings, but then I realized it was HER cake, and it was beautiful just the way it was. I think she was pretty happy with her beautiful butterfly birthday cake! ← Now That’s a Whale of a Story! Those cakes are so awesome! Hubby made Jonathan's this year, but neither of us get very fancy. It was chocolate with chocolate icing. That was all. It was really good, though. But yours are beautiful! you put me to shame. (hang down your head Tom Bex, hang down your head and cry)your cakes are beautiful – as is lily's. AND your pony was drawn beautifully! What a sweet tradition. The cakes look really cute, I think you did a wonderful job.Happy 5th Birthday Lily ! Wow, good job with all of those! And I love her butterfly cake. 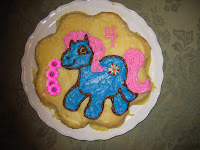 Happy Birthday to Lily!And you draw a good My Little Pony! Whoa.